I’m quite partial to memorabilia, and I have a passionate interest in the life and work of Flinders Petrie, not just because he’s a an impressively beardy archaeologist and legend, but also because for some years now I’ve been responsible for looking after his collection of Palestinian antiquities at the UCL Institute of Archaeology Collections. So I was quite chuffed when I did a search on Ebay a few years ago, and came across this inspiring item. 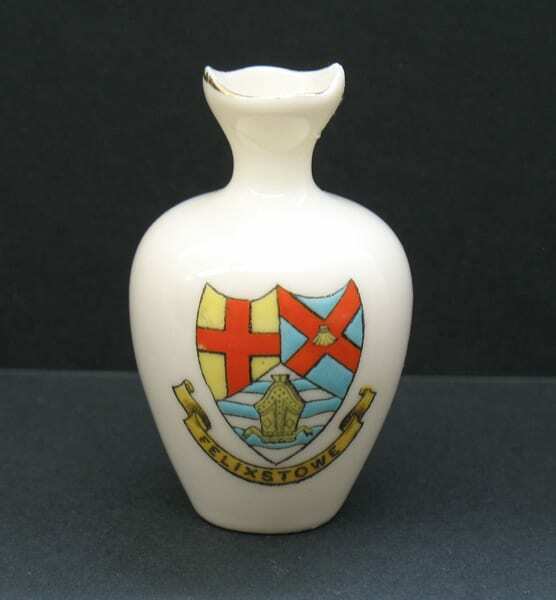 This little vessel is around 6.2 cm high, and forms part of a range of model vessels produced as seaside souvenirs from the mid 19th century onwards. 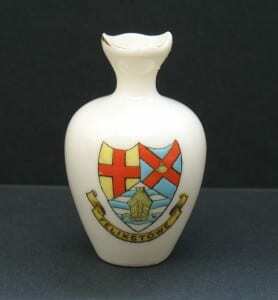 The group is known as ‘Crested Ware’ because many pieces bore the coat of arms and name of the places commemorated. The craze was started off by a company called Goss, and picked up by other factories such as Carlton. I haven’t yet identified the potter’s mark on the base of my piece, so I can’t yet say in whose house it was born. So why was I excited by this? Well, take a look at the inscription on the base. 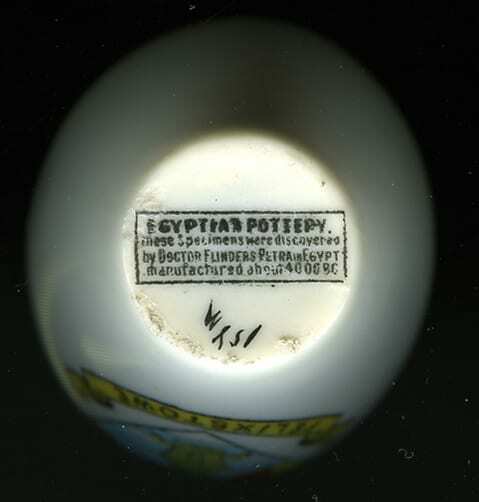 Stamped on with an endearing air of authority, this reads: “Egyptian pottery. These specimens were discovered by Doctor Flinders Petrie in Egypt manufactured about 4000 BC”. Needless to say, this was enough to pique my interest, and the little bottle soon became mine. It now sits in pride of place on my office shelf. To set the scene further, one of the things about crested china is that it was often made in the shape of notable things from the featured town. Just as you might go to Paris and buy a model of the Eiffel Tower, you could pick up a porcelain model to remember your English holiday. So you find Crested Ware ships from Liverpool, the Skegness Clock Tower, or a lifeboat man from Burgess Hill (and no, Burgess Hill isn’t on the coast, so I can’t claim to understand that particular souvenir). And alongside this, a range of ‘replica’ ancient vessels. 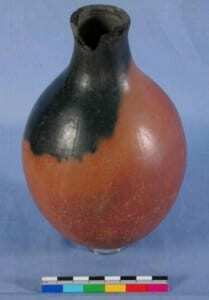 As their inscriptions often attest, many commemorated the discovery of the imitated pot by local antiquarians. So let’s come back to Petrie’s own commemorative vessel. Well I don’t know about you, but this seems like a master class in wilful misunderstanding, misdirection and plain misappropriation of the past. I love the idea that a tiny piece of manufactured tourist tatt can be dignified with the label ‘specimen’ – very much in vogue with the zeitgeist of the English gentleman collector. You too, it seems to say, can become a part of this club and buy an almost-genuine replica piece of the past. I also love the fact that the label is about as far removed from the reality of the original as you can get. Egyptian pottery of the kind Flinders Petrie discovered? The shape is wrong. The colour is wrong. The surface texture is wrong. And the cheerfully bright branding of the body with the coat of arms of a tourist resort is so, so very wrong. Like Tim Vine’s crime in multi-storey car parks; this is just wrong on so many levels. 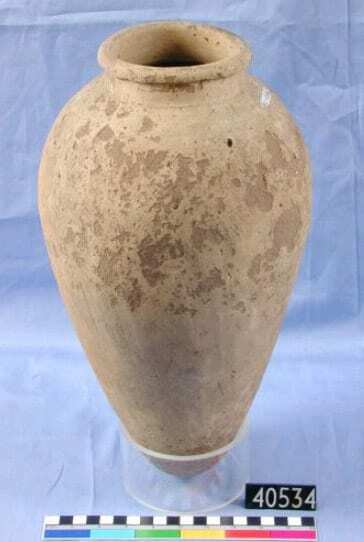 For those of you who might not be familiar with what real Predynastic pottery looks like, here’s a sample from the collections of the Petrie Museum of Egyptology. You can find a fuller range on the Digital Egypt website. You see my point? Not a shiny white surface with gilt edging in sight. If an archaeologist of the future came across this piece of Crested Ware, I can see all manner of amusing things ensuing. So picture this: the critical moment in a future dramatized version of Petrie’s life and career, where they show the Great Man opening up an undisturbed Predynastic tomb for the first time. “What do you see”? Ask his companions. Petrie was, in many ways, a brand; it was largely his reputation and force of personality that enabled him to raise the funds needed to support his work throughout a long and successful career. This little object is a glimpse into a side of Petrie’s fame that we don’t often see – how others might also climb onto the Petrie bandwagon and make it work for them. If anyone has any other pieces of Petrie-inspired Crested Ware, I’d love to hear from you. Was my porcelain piece of ancient Egypt a lone stab at bringing the mysterious Orient on holiday to the English seaside? Or did it come on the crest of a much bigger wave? Rachael Sparks is a Lecturer and Keeper of Collections at the UCL Institute of Archaeology. ADDENDUM: How quickly blogs go out of date! More research has revealed that my vessel was part of a range made by Grafton China, probably between 1906 and 1913. They did a series of Petrie inspired pieces, but consistently called him ‘Doctor Flinders Petra’ throughout (wrong title, wrong name – but we know who they mean).